Sample of guns seized by the TSA. Despite repeated publicity about the rules, Americans don’t seem to get that they can’t carry (often loaded) guns in their carry-on bags. 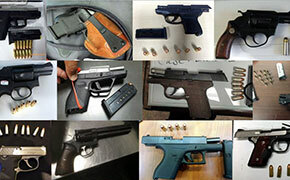 A record was set on 23FEB when Transportation Security Administration officials found 21 firearms in carry-on bags – in one day! That beat the record of 18 set on a single day in 2014. During that week in February 79 firearms were discovered in carry-on bags at airports around the country. A live smoke grenade was also confiscated among a trove of the usual dangerous items such as knives, stun guns, replica firearms and “many other prohibited items too numerous to note,” the TSA said. Last year TSA officers found a record 3,391 firearms at the nation's airports, up by more than 25% on 2015. Perhaps if pax knew their guns might be stolen from their luggage they would think twice. Last week an airport baggage handler who formerly worked for Austin-Bergstrom International Airport in Texas (AUS) was arrested for allegedly stealing handguns from checked luggage and trading them for marijuana. The criminal complaint claims 25-year old Ja’Quan Johnson managed to steal an unspecified number of handguns from inside the checked baggage of passengers at the Austin airport between 29NOV, 2016, and 2FEB, 2017. Johnson is also accused of trading several of the weapons for marijuana. The Austin Police Department announced that it had recovered seven stolen firearms and seized an unspecified amount of illegal drugs in connection to Johnson’s alleged crimes, as well as making two arrests of the former airport employee’s accomplices. Johnson faces up to 10 years in a federal prison if convicted of the crimes, but he was released on a personal recognizance bond following his initial court appearance.